I would be forever grateful to online dating site because I wouldn't have my loving husband and two beautiful children without it. I remember when my student assistant in the office where I worked then told me to make a profile to this dating site, I told her that I don't want to do it because I was so busy writing my thesis then. She said, I'll make one for you, I agreed to her suggestion thinking that she was just kidding. But to my surprise, she really did it. I wasn't really serious about it until one day this guy frantically left me a message to just contact him in email because his free trial expired. Since my free trial had expired too, I sent this guy an email. And that's when our love story began. From email communication to talking on the phone every so often, we are now happily married for 6 years with two adorable kids and thanks to online dating for it! 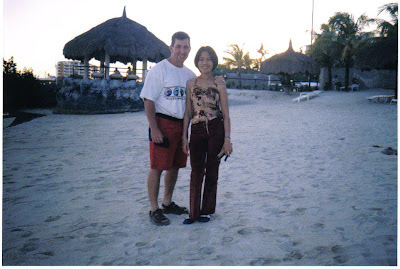 The picture below was taken during our honeymoon in Cebu, Philippines five years ago.